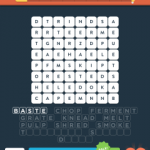 Stuck in Wordbrain 2 Cooking Verbs (Word Oracle 8×8). Here are the answers. Wordbrain 2 Cooking Verbs Level 5 – Braise not Flambe.